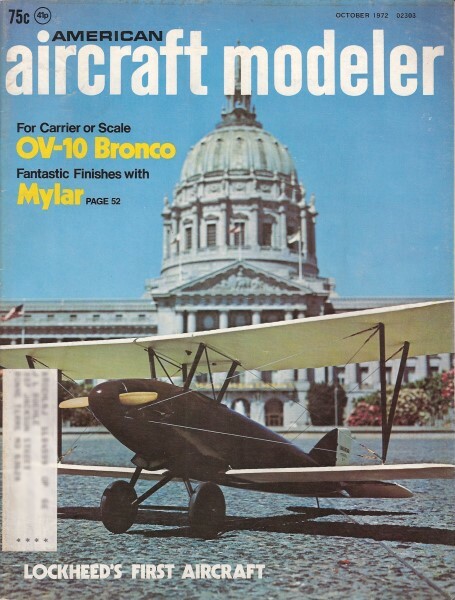 Here are article and plans for the Loughead Sport Biplane Model S-1 Plans, that I electronically scanned from page 42 of my purchased copy of the October 1972 edition of AAM. You might be able to scale up the image below if suitable plans cannot be located. 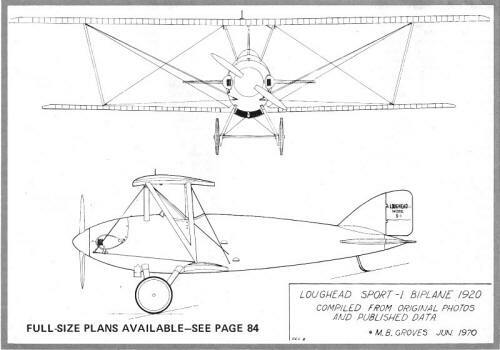 Plans for this fine model were drawn by Mr. M. B. Groves. All copyrights (if any) are hereby acknowledged. Click here for the accompanying historical article on the Loughead S-1. "In 1919, Loughead [later renamed Lockheed] Aircraft entered the small aircraft market with the revolutionary single-seat S-1 Sport Biplane. 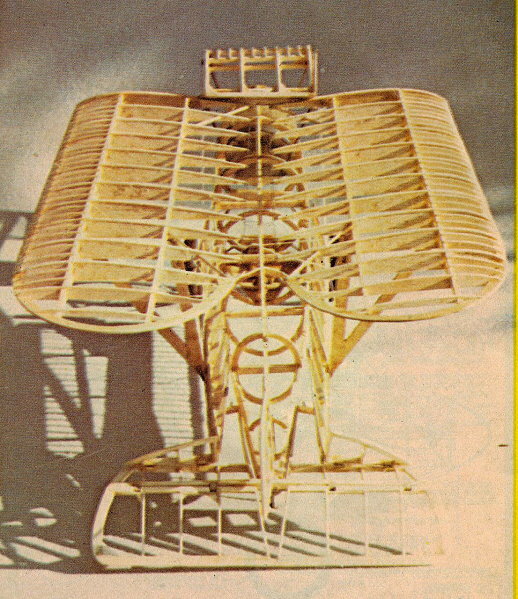 Intended to be "the poor man's airplane", it featured an innovative molded plywood monocoque fuselage for which the Lougheads, Northrop and Tony Stadlman received a patent. Its foldable wings allowed the plane to be stored in a garage, and the lower wings could be rotated to act as ailerons and airbrakes. Because no suitable engines were available, the company designed and built its own 25-horsepower water-cooled engine for the S-1. The S-1 was tested successfully at Redwood City, CA in 1919 by Gilbert Budwig and flew well. After the S-1 completed its test flights, the pilot said it was the most flyable plane he had ever flown. The plane went on to make hundreds of flights and proved to be a very successful design. At an aircraft show in San Francisco, thousands admired the little S-1 aircraft, but not a single person ordered the $2,500 plane. Only then did Allan Loughead realize that the government's sale of war surplus aircraft for as little as $300 had killed the market for new aircraft. 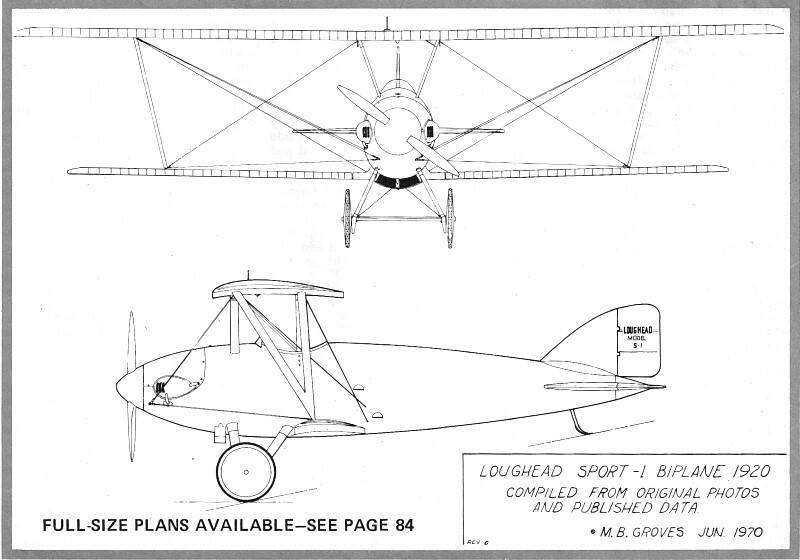 As a result, Loughead Aircraft closed its doors in 1920 and its assets were liquidated in 1921. - Wikipedia"
A replica-in-miniature of the most technically advanced biplane of all time. Model includes all the real plane's unique features, too. by Monte Groves, Sunnyvale, Calif.
Loughead S1 - That's all the instrumentation the real plane had, too, but arrangement of dials is only a guess. Loughead S1 - The one-and-only Loughead S-1 engine and the one-and-only Tony Stadlman meet again in San Francisco. As Loughead's factory superintendent, Tony's support in this research project has exceeded all bounds. 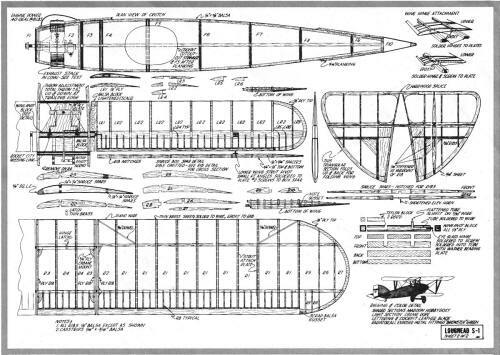 One can become addicted to early aviation research. After researching and building a model of Wiley Post's beautiful Winnie Mae (August 1970 AAM), we became interested in the aircraft im­mediately preceding the Lockheed Vega. Precursor to the Vega was the Loughead Sport-1 biplane, and research into this little-known one-of-a-kind air­craft has been an engrossing and fas­cinating project. Though built and flown 52 years ago, with the exception of Allan and Malcolm Lockheed, most of the original participants are still with us. And with­out their cooperation, the S-1 project would never have gotten off the ground. During the Vega research we came across six photos of the slender little bipe. With these and five or so others we located in the Lockheed-Burbank files, we began the project. After two years of constant correspondence and probing into various personal and public ar­chives, some 55 construction and flying photos have been amassed. The original 1920 Loughead sales brochure, as modi­fied, provided all the dimensions. 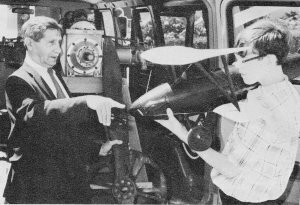 Interviews and correspondence with Jack Northrop, the principal engineer, Tony Stadlman, the shop superintendent who built it, Gil Budwig, the original test pilot, and several others provided an almost complete story. One of the more exciting side effects of historical aviation research came the day my wife and I drove home with the original, one-and-only, two-cylinder engine, its propeller and spinnerring. The S-1 engine, which had dropped out of sight for over 30 years, is slated to go to the Smithsonian as soon as it's overhauled and test run, providing I can locate a Master Carburetor. 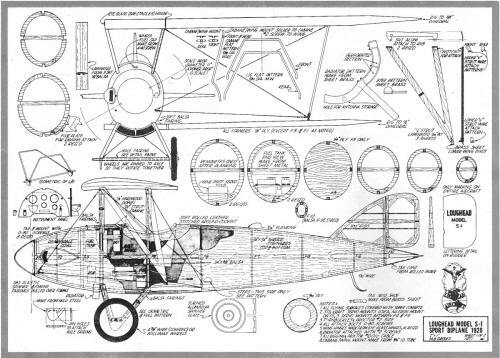 Since no original drawings have been found, the drawings with this article were generated over a long period of time, and are based on the photos, published dimensions and review by the men who created and flew the S-1. Data and photos are still being located, so the search will continue. 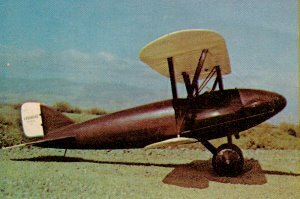 The Loughead S-1 had several unique design features-an elliptical molded, monocoque fuselage, and for lateral control the entire lower wing pivoted at the root. After landing and during the landing roll, the pilot could disengage the lower wing and pivot the entire lower wing 90° to assist it in braking to a stop. The wings folded up so that the plane could be towed down the highway and stored at home. 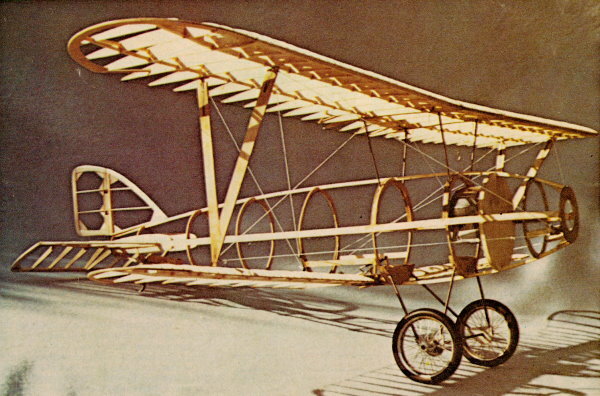 The configuration of the model of the Loughead S-1 is scale, and based on the 1:1's appearance at the 1920 San Francisco Aero Show. Like the original, the model is complete with folding wings. Since most of the flying of the real aircraft was done without the cheek cowls, these can be eliminated and you'll still be "scale." While the model has folding wings, they can be eliminated too, if you're concerned about the structural integrity of what appears to be (but isn't) a Mickey Mouse arrangement. 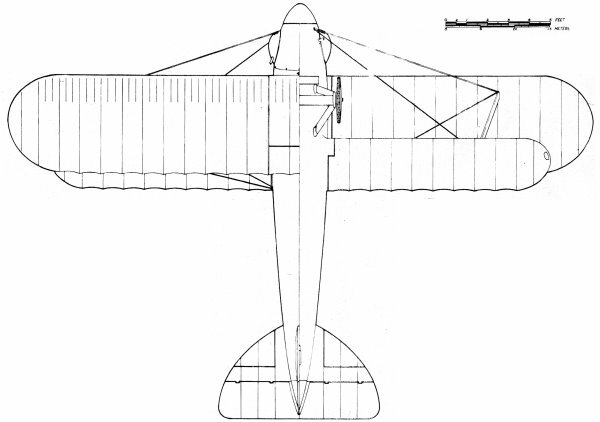 The folding wings were built into the model to confirm the functional operation that the original designers intended and to further confirm that the dimensions and proportions were correct. Except for the lateral control surfaces, which may seem strange but really are practical, the aircraft is conventional in configuration. Wings: Wing construction is conventional with the exception of the trailing edges. To obtain the scalloped effect, use 1/32" wire, much the same technique as on the original. Small brass tabs are spaced two in. apart and soldered to the wire edge prior to attaching it to the ribs. This, coupled with the use of one­piece Super Coverite covering for each panel, provides the proper amount of shrinkage for the scale, scalloped effect. The lower wing is built up using a spruce box spar which will carry the required loads when it's used for lateral control. The number of ribs and their spacing is scale with respect to the original. However, the airfoil still isn't exactly known, so the model airfoil is approximated from the photos we've collected. The "V" struts, the cabane strut construction, and their installation are shown on the plans, and are easy to follow. The small fittings on top of the cabanes for wing and wire attachment are made from tubing and soldered to the cabane wire mounts before the wood fairings are attached. The plans depict a different leading edge than that shown in the construction photos. The more solid leading edge shown on the plans will tend to keep the wings from warping. To cover the wings, cut one piece of Super Coverite to cover both top and bottom of the wing. Start at the leading edge and cover the bottom to the trailing edge; follow Coverite's instructions. With the bottom section now covered, continue up and over the top so that you end up back at the leading edge. Super Coverite provides additional strength to the wing, and the shrinkage can be controlled without getting out of hand. Fuselage and Empennage: As with the Lockheed Vega model, we chickened out in making a scale concrete mold for the molded fuselage halves. The model is planked over a preformed skeleton frame. Construct a crutch, and attach the top and the bottom formers and stringers. This helps reduce the likelihood that you'll run into a fuselage warping problem, which is, as we all know, a giant pain in the neck. All formers, except for F-1, the firewall, F-3. and the end former F-1D, were made from 1/8" ply. F-4 and F-5 are to be doubled later, as shown, and provide suitable landing gear and cabane mounting. Form the front and rear landing gear struts from 5/32" wire from the flat pattern as shown. After confirming alignment, solder the struts to the mild steel fittings as shown in the isometric. After the landing gear assembly is completed, install it and epoxy it well in between F-4 and F-5. (Double up F-4 and F-5 as shown.) Be sure of your alignment because it's difficult to get to afterwards. The S-1 had an axle, which, when used properly, helped prevent ground handling problems. Pin the wheels to the axle so that they'll turn together as a unit, not independently. 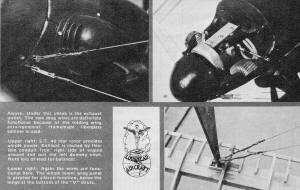 The conventional, early Loughead tail skid is made from 5/32" wire with a soldered brass shoe. Attach this to the lower stringer, blocked, as shown. Remember to keep the entire structure lightweight toward the rear. The end former, F-1D, is made from 1/4" balsa and is left solid until after planking is complete. When you've finished planking, cut out as required to give enough clearance for the empennage controls. The cabane struts are installed between the doubled F-4 and F-5, and epoxied well into place. Because of cramped working space, solder up a fuel tank that mounts per­manently behind the firewall, then snake the venting fuel feed lines through the firewall. The filler tube is installed up through the top of the fuselage, and is threaded to match a 4-40 screw which was modified with a butterfly head. 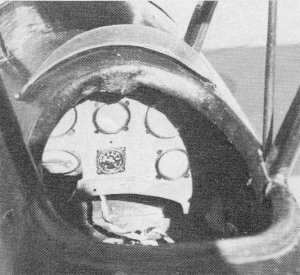 (On the real S-1, this screw cap covered the water tank to the water-cooled engine.) Be sure to completely check your home­made tank for leaks before installation. Because of limited space I selected a rear rotor, Supertigre 40, with a Perry carb to improve idling. Mount this to a wooden rail mount of your own design. Attach the rail mount to the firewall with No. 6 blind nuts with Allen head screws. 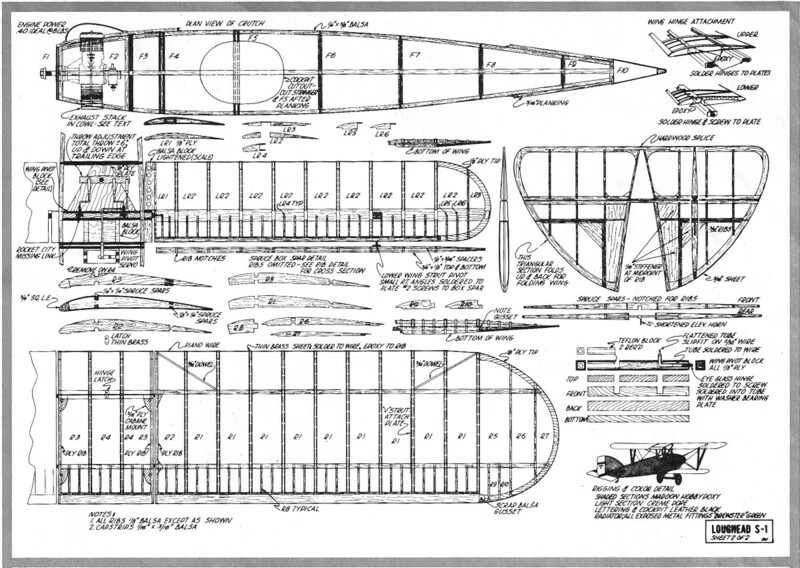 The lateral control provided a unique challenge to implement, and while it eventually worked like a charm, it gave us all sorts of headaches until Jim Sunday, famous local "test pilot" and bosom chum, came up with the clever concept shown on the plans. The wing pivot block, which provides the lower wing support and pivot drive, is a ply structure with the pivoting assembly supported in a Teflon block. There's no way that this can bind. The pivot block is installed and blocked in as shown just aft of F-5. Check for alignment and centering. The total movement of the lower wing is only ±60°. It must be positive with little or no slop. The lower wing is attached to this pivot point by scrounging some eyeglass hinges from your local optometrist. The lower wing is held on with the screw that holds the hinges together. Carefully solder each side of the hinge - one side to the plate which you've epoxied and screwed to the wing, the other side to the pivot shaft in the block. Provide two additional balsa formers up front around the engine compartment: one in front of the firewall, F-3, and one behind the front ring, F-1. Force them into place between the crutch and glue to the top stringer, but do not glue to the crutch or F-1 or F-3. You're almost ready to plank. But first install your servo trays, and check out your servo action on the lower ring pivot and throttle. I used standard servo mounting trays mounted to hardwood rails between the formers. Attach and glue the Super Coverited horizontal stab to the fuselage. This should be done with the elevator attached to insure proper operations. Now glue the vertical fin directly to the fuselage after squaring it with the stabilizer. Cut out F-10 and connect the rudder and elevator controls. Layout and cut the planking for the cockpit. This requires cutting through the top stringer and the doubled F-5. Use your razor saw to cut F-5 vertically. After some additional sanding and filling, cover the entire fuselage with Super Coverite, using longitudinal strips overlapped. This adds unbelievable strength and cuts finishing time by more than half. Up front, cut out the cowling using a razor saw to cut vertically between the formers F-1 and F-3 and the extra unglued balsa formers. Now cut horizontally along the top of the crutch between F-1 and F-3. And out pops a cowling! Cut out the cylinder and exhaust areas, and install the engine and exhaust. Fittings, etc. 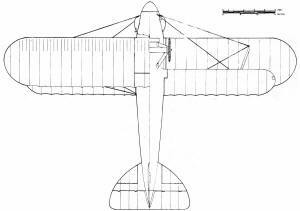 : The S-1 had a non­standard Albatros, Halberstadt, rounded-type, Snyder-type spinner. To achieve this miserable shape, heat 1/8" ABS sheet plastic, and pull over a turned form. The ABS plastic spinner is mounted to the aluminum spinner plate with 0-80 screws. Cut out notches on either side of the plastic spinner for the 11" wooden prop. Cheek cowls, if used, can be made in a similar manner to that of the spinner. Just remember, you've got a double compound curve over which it must fit. The removable instrument panel is made from ply. Using double sticky foam tape, mount your battery pack to the back of the panel. Sprinkle the panel lightly with the basic instruments: airspeed, throttle (right side), oil pressure, water temperature, altimeter and compass. Other than the type of instru­ments used and the location of the throttle, the exact panel layout is not known at this time. The bottom of the pilot's seat is made from balsa and the back is made from shaped cardboard. The whole thing is covered with an old, thin piece of scrap leather. The tail cone is a piece of bond paper that's been rolled and glued with a balsa plug. Attach the tail cone to the fuse with pins. The windshield frame is brass. 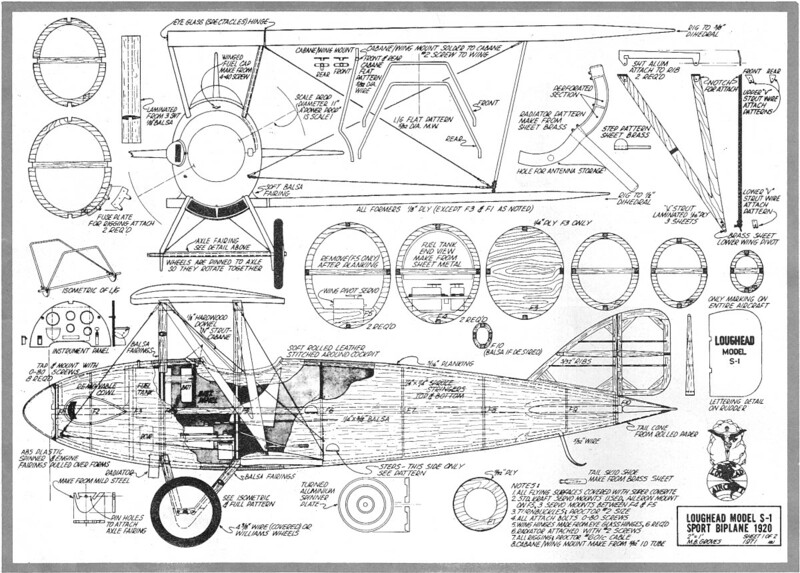 A single piece of butyrate plastic windscreen is set in the frame and attached to the fuselage. A soft, old, bought-in-Hong Kong leather wallet was used for the padding around the cockpit. Contact cement will attach it around the cockpit. Then stitch it through the planking and Coverite to hold it securely and, at the same time, give it an authentic appearance. The original S-1 had wire wheels with fabric wheel covers. Use four circu­lar disc pieces of old sticky Coverite. (Cut a 1/4" axle hole.) Very carefully remove the tire, place the Coverite over the wheel, and press the Coverite discs up and over the edge of the flange, one for each side. Carefully replace the rubber tire. This will hold the cloth discs in place while they're being painted. The wire spokes tend to press through the cloth covering which provides that little extra touch of realism. Using the pattern provided on the plans, solder up the underslung radiator from a piece of sheet brass. Attach it to the fuselage with 0-80 screws. Incidentally, use the inside of the radiator to stow your antenna when you're not flying. Use butyrate dope for the cream surfaces and Hobbypoxy for the maroon. You'll have to mix all colors. As for cream, it is cream, Insignia White plus a little yellow. As for the maroon, this nondescript color just about brought our happy marriage to an end. Mix maroon, call it Maroon, and stick to it! The color that best matches is the same as fresh beef liver. How about that reference? Center of Gravity: With respect to CG, after much debate we decided to ignore the small lower wing and place the CG as shown. When I'm building, I have a tendency to get a little tail heavy (as well as on the model), so I had to add a remov­able lead horseshoe around the engine. If you have to add such a mass, be sure that it's well secured. With an 11" power prop and the ST 40, we took it to the field and fired it up. Cameras at the ready; fingers, etc., crossed, we watched Jim Sunday start his take-off roll. Man, straight as a die. Up and out. Jim was a little concerned about using the lower wings for lateral control, so he didn't plan to try them until he'd gotten up a little higher. But just after it broke ground, it started a very slight roll to the left. Jim hesitantly and cautiously applied the correction. It worked! Then, up and around the pattern. For the benefit of all the highly-skilled photogs, he made several circuits. High­speed passes. Low-speed passes. Around and around and around until my suggestions to "bring it in, Jim" were bor­derline violent. "Ya know," he laughed as he made one more circuit, "a guy could get addicted to this little wing-pivoting toad." Then lining up for the approach, he throttled back and the engine quit cold. (This, due to a minor pre-flight adjustment.) On in she came, then touched down just like it was supposed to. Those pinned-together wheels are the only way to go. After congratulations all around, it was discovered that the only problem was none of the ground cameras were working. So, confident with our S-1, Jim did it all again, and when I became certain he was determined to run out of gas, I had to threaten him to bring her down. Shortly after the second flight, we discovered a leak in the fuel system and my receiver was soggy. I got my radio out of there in a hurry, and we hung up the S-1 in a place of honor in Jim Sunday's hobby shop. One evening, a few weeks later and just before Christmas, Jim was open late. Along with the fact that it hadn't been exactly a banner-type day, Jim was alone in the shop and hadn't had his: dinner. He was feeling less than jaunty­jolly when a young guy strolled into the shop and started the normal I-just-came­in-here-to-kill-time casual gazing around looking at all the "toy" airplanes hanging from the ceiling. Jim folded his arms, leaned up against the wall and watched the guy through heavy-lidded eyes. The young man looked at the S-1, and then after making a few rather cool remarks about it, he said, "Is that thing supposed to be scale?" The eyelids crank up. "You bet it's scale. That airplane is exact. And anyway, who're you?" "Oh, I'm sorry. I didn't introduce myself. I'm Allan Lockheed, Jr."
Not only do poor beleaguered hobby shop owners have to put up with so­called scale experts all the time, occasionally they have to endure practical­joking friends, ex-friends, and, oooh, it was beauty-full.